Werner Herzog Stipetić (German: [ˈʋɛɐ̯nɐ ˈhɛɐ̯tsoːk ˈstɪpɛtɪt͡ʃ]; born 5 September 1942 in Munich, Germany), known as Werner Herzog, is a German movie director, producer, screenwriter, author, actor and opera director. He is known for directing science fiction or just fiction movies and documentary films. 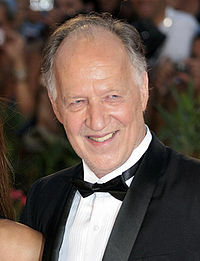 Herzog is thought to be one of the greatest German movie directors. ↑ "40 Great Actor & Director Partnerships: Klaus Kinski & Werner Herzog". Empire Magazine. Retrieved June 19, 2010. Encounters with Herzog - a film competition. Judged by Herzog on the independent filmmakers networking community Shooting People. This page was last changed on 4 May 2018, at 05:23.